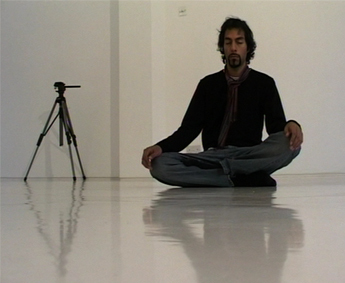 Meditations in the Space' builds on an earlier series of works which I entitled 'non-actions', exploring the idea of performance as a passive-aggressive space. These involved me meditating in a public place (the idea of public being analysed by setting these in locations as far afield as central Amsterdam, or the desert in Pakistan), for the duration of a DV tape (60 minutes). His work will be presented in the forthcoming exhibition ‘The End of Civilisation’ Port Eliot Lit Fest (July 2006). Zoo Art fair, with T1+2 Artspace (October 2006). 13 Satellites of Lahore, Pakistan (April 2007). He will have a solo show touring Castlefield Gallery, Manchester & Herbert Read Gallery, Canterbury (2007), and ‘FEATURE’ a large-scale film/performance/event at Wysing Arts (2007). Recent solo shows include: (2006) Shezad Dawood & Friends, Artists’ Studio, London SW1, (2005) Paradise Row, London E2 curated by Chris Hammond, text by Lisa Le Feuvre (2003) ‘Shrine’ – 1,000,000 mph, Old Bethnal Green Road, London E2 (2002) ‘Multiplicity’ - Osterwalder's Art Office, Hamburg. Shez 360 ‘ - Djanogly Gallery, Nottingham (2001) ‘Karma Cola’ - Osterwalder's Art Office, Hamburg, & Tablet, Tabernacle, London W11. Recent group shows include: (2006) ‘territories of Duration’,Karsi Sanat, Istanbul (curated by Gulsen Bal & supported by the British Council); ‘Lila/Play’, Span Gallery, Melbourne. ‘Very Funny: Humour in Video Art’, Gallery Chemould, Mumbai. ‘East Wing Collection’, Courtauld Institute, London. (2005) ‘Yabba Dabba Do’,Cell Project Space, with Hilary Koob-Sassen. ‘London in Six Easy Steps’, ICA, London curated by B+B. ‘Go Between’, Kunstverein, Bregenz, Austria (www.bregenzerkunstverein.at), catalogue published by Revolver Books; Belluard Bollwerk International, Fribourg Switzerland; ‘The Condition of England’ – Northern Gallery for Contemporary Art, Sunderland; ‘We Have Met the Enemy & He Is Us’, Redux, 116 Commercial Street London E1 (conceived and curated by Shezad Dawood - go to www.reduxprojects.org.uk);‘Gigolo’, Trailer, Trafalgar Hilton, London SW1, curated by Juan Bolivar. ‘Showcase’, City Art Centre, Edinburgh; ‘Sci-Fi’, MOT, Regent’s Studios, Andrews Rd, London E8.